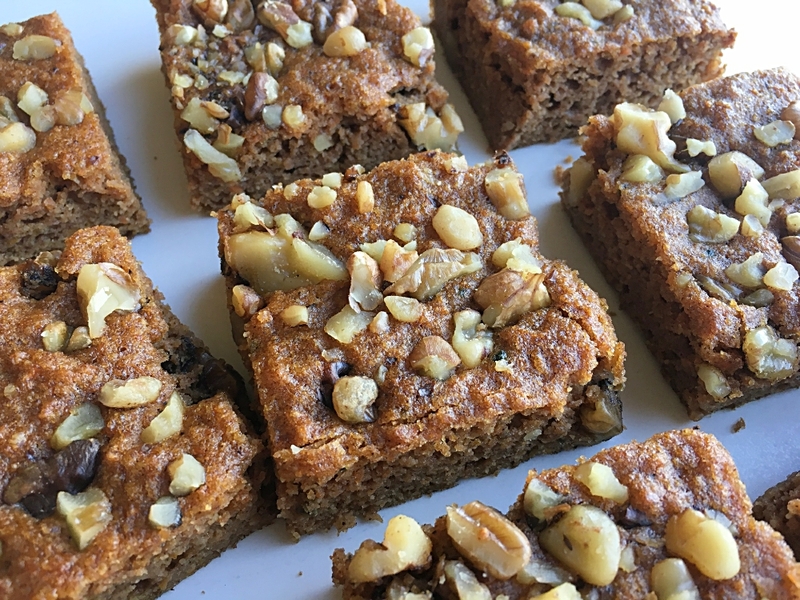 I created Carrot Cake Breakfast Bars with busy moms in mind who want to feed their kiddos a good breakfast on the fly and sneak in some veggies on the way. These bars do double duty for after school snacks as well. Or for mom for tea time with a friend. Bonus, they are made completely in the food processor. 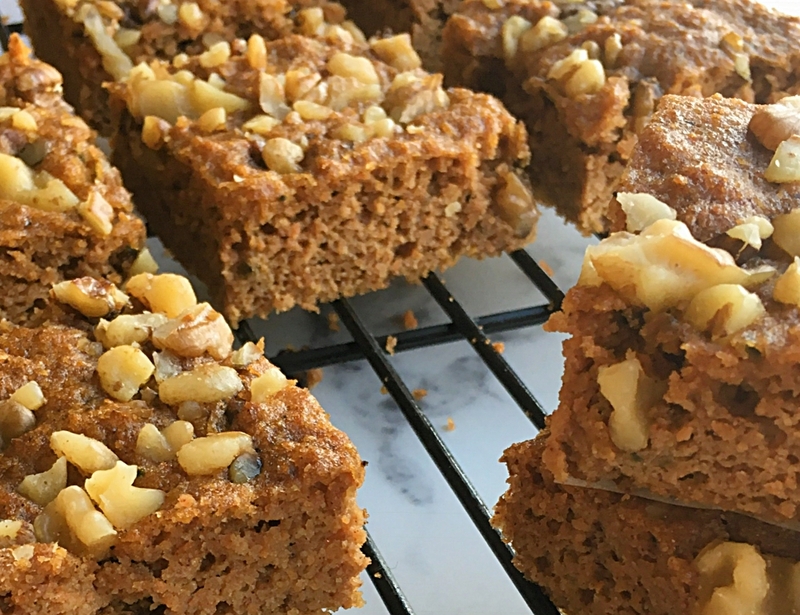 I mean, when you grow monster carrots, and a lot of them, you get real creative and out comes Carrot Cake Breakfast Bars. Gather all of your ingredients and preheat your oven. We’re gonna have some fun! 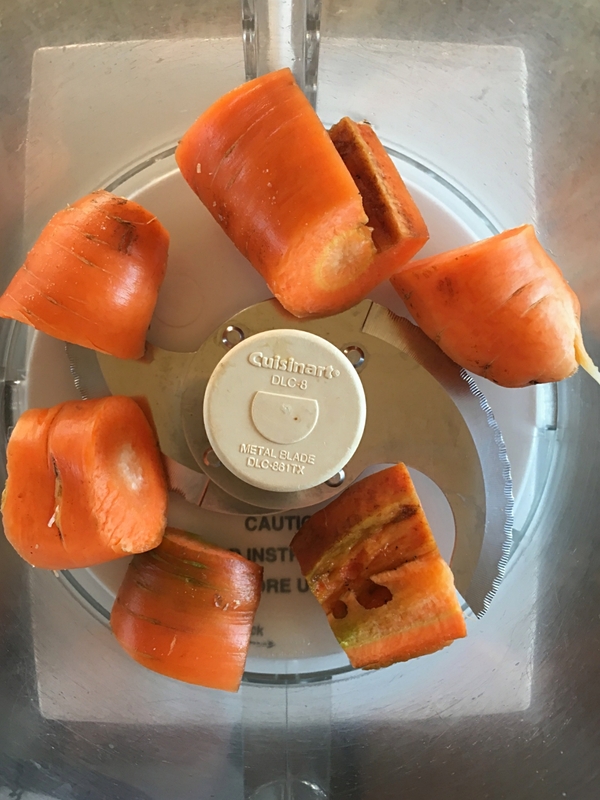 Instead of hand grating the carrots, I put them through a spin in my food processor. Once grated, I measured enough for the recipe and any leftovers I put in a salad. 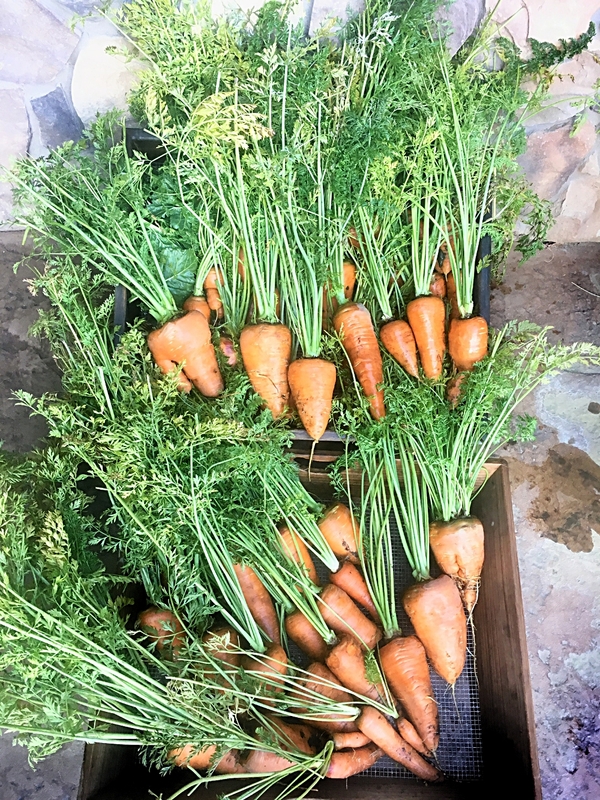 Notice these homegrown carrots! They look nothing like the wimpy carrots you buy at the store. Grate them fine leaving no large particles. If you want to grate yours by hand, that’s okay too. Lining your pan with parchment paper makes it easier to cut into bars later. Trust me on this one. 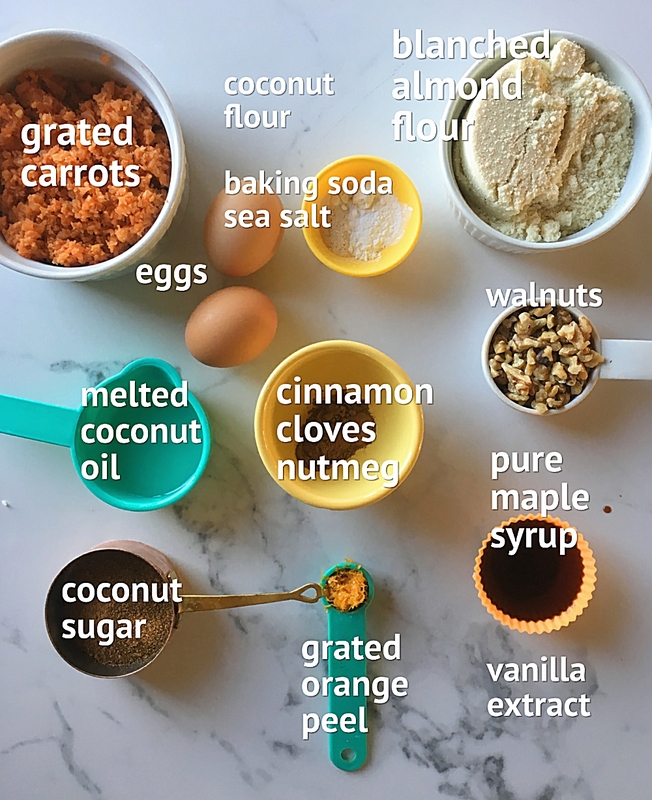 Be prepared for your house to have all those yummy fall cozy feels while they bake. It’s likely they’ll disappear right away but if you want to save them for another time, they freeze well in an airtight container. I’d love your feedback so make these and tell me what you think. In cooking class news, it looks like I will have a full house for the upcoming Holiday Pies and Treats classes. Can’t wait! However, if you haven’t registered and want to come, still contact me because sometimes I will have a cancellation. There’s something deeply rewarding in the process of welcoming people into my home, cooking and chatting together about good food, improved health and how to do it when you’re so crazy busy and there are too many mouths to feed. And then people who just met at the class, all sit down together and share a meal. The common table brings us together, sweet banter takes over and out of nowhere friendships are born. It’s a beautiful mystery that I can’t explain. But it happens and I love it. Preheat oven to 350 degrees. 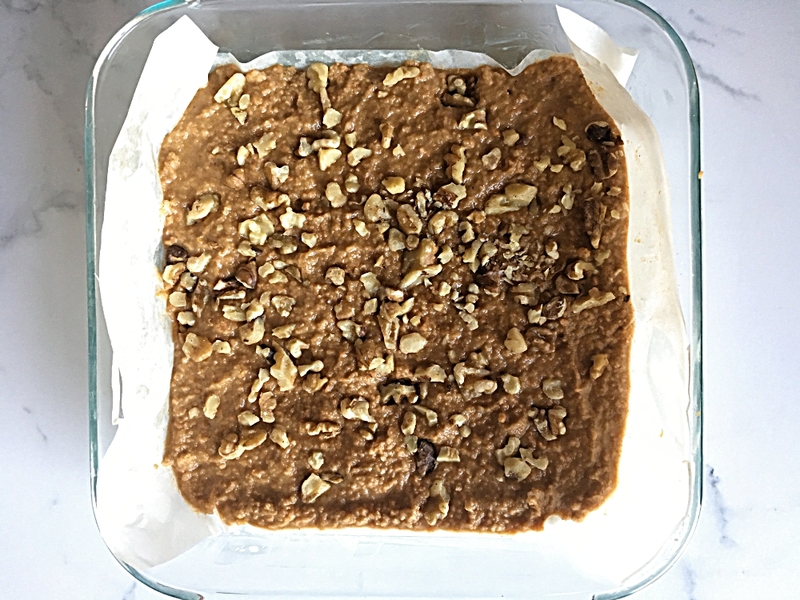 Line an 8 inch square baking pan with parchment paper or greased foil. Let it go up the sides in order to be able to lift the bars out when done baking and cooling. 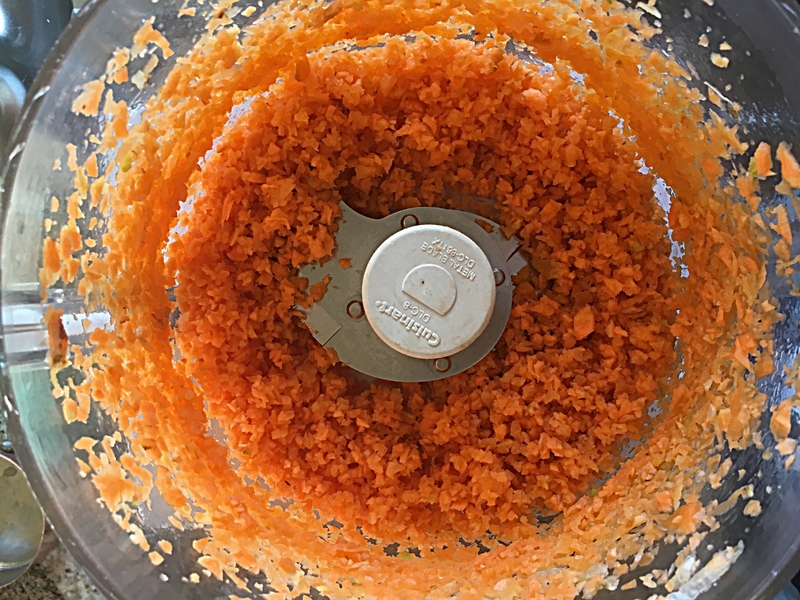 Place the grated carrots and the rest of the wet ingredients in the bowl of the food processor. Blend mixture until well combined. Add all of the dry ingredients (except walnuts) and process, mixing well. 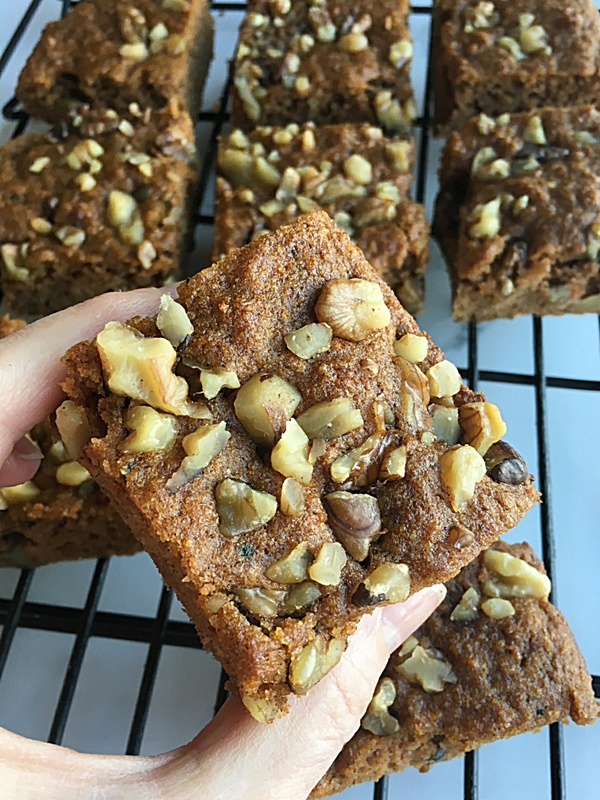 Pour batter into prepared pan, sprinkle chopped walnuts on top and bake on the middle rack at 350 for 20-25 minutes. Remove and let cool on cooling rack for 1 hour. Lift out of pan using edges of parchment paper. Once completely cooled, slice and enjoy or wrap in an airtight, freezer friendly container and freeze up to 1 month. Thank you Kellie! So happy you liked them!